Dr Ibha Kumari, MD, DNB (Obs & Gynae) is Senior Consultant Obstetrics and Gynaecology st Alchemist Hospital Panchkula. 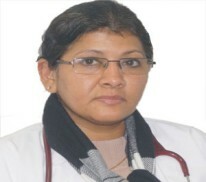 Dr Ibha has done her MD (Obs & Gynae) from the renowned and reputed Institute, Postgraduate Institute of Medical Education and Research Chandigarh. Post her MD she has done DNB (Diplomate from National Board of Examination) in Obstetrics & Gynaecology. Dr Ibha has a rich experience of more than 18 years respectively having formerly worked as Senior Consultant in reputed Government Institutions such as Government Medical College and Hospital (GMCH, Sector 32) Chandigarh. Dr Ibha has proven expertise in Laparoscopy, Hysteroscopy, Colposcopy as well as Urogynaecology. The chief area of interest as well as specialization of Dr Ibha is in High Risk Pregnancy and Infertility, chiefly IUI. To her credit Dr Ibha has many publications in academic journals of National and International repute.